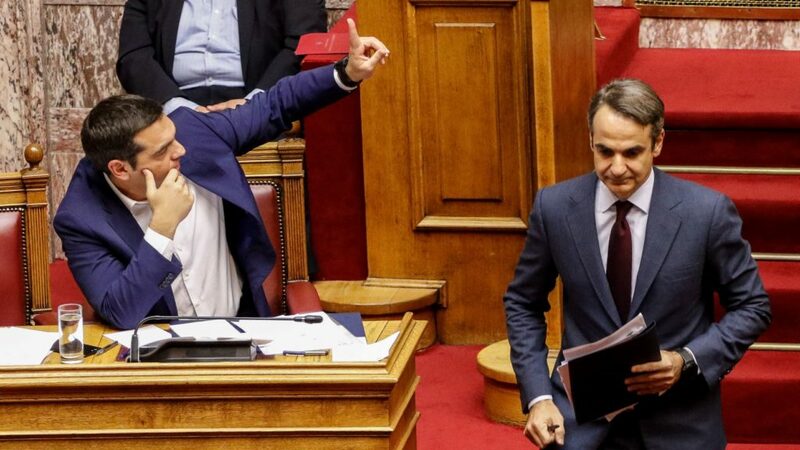 Prime Minister Alexis Tsipras and New Democracy Party Leader Kyriakos Mitsotakis. The Greek parliament’s vote expected tonight on a deal with Macedonia for the latter’s name change was postponed to tomorrow due to the large number of deputies who want to speak during the debate, eKathimerini reports. The delay shows the high relevance the deal has for the Greek parliamentarians and society. The deal for Macedonia’s name change was agreed between the Greek and Macedonian prime ministers Alexis Tsipras and Zoran Zaev. Once ratified by parliaments of both countries, it could open the way for the now “Republic of North Macedonia” to join the EU and NATO. The crucial support of opposition’s Albanian parties, enabled Zaev to secure enough votes in parliament to ratify the deal, thus changing country’s name to North Macedonia. If successful, the vote in the Greek parliament will be of historic proportions for countries’ bilateral relations, as well as with potential positive effects for the Balkans. Serbia and Kosovo are also engaged in negotiations for the normalization of their relations, albeit seemingly unsuccessful ones. However, a positive result of Friday’s vote in the Greek parliament is expected to intensify the constructive pressure by the international community on a deal that would bring Serbia to recognize Kosovo’s statehood. Both countries’ advancement toward the EU is dependent on a final bilateral agreement. Furthermore, the stalled negotiations between Albania and Greece for an agreement on the maritime border could also restart under the leadership of prime ministers of both countries, who also lead the ministries of foreign affairs. Meanwhile, the Macedonia name change deal is facing strong opposition in Greece. Opposition’s main party, the New Democracy, argues that prime ministers’ agreement doesn’t give an end to the potential future territorial claims by (North) Macedonia on Greece’s own northern region of Macedonia. Several protests in Greece during the last weeks have turned violent. Today supporters of the Greek Communist Party (KKE) also staged a protest in Athens. However, Tsipras seems confident in securing the majority of votes for the deal in the 300-seat parliament. The ratification requires only half of the votes of deputies present in the session but Tsipras has stated that he will get an absolute majority of at least 151 of the 300 votes.